The discovery is detailed in a paper for the Monthly Notices of the Royal Astronomical Society and reveals how this huge ‘tantrum’ could even perturb the material orbiting a star which would create the building blocks for future planets. James, who is studying in the University of Warwick’s Department of Physics, said: “This is normally a star that shows little activity and stays a constant brightness. Then, on this one particular night, we saw it suddenly grow seven times brighter than normal for a few hours, which is pretty extreme. And then after that it goes back to normal. “We see these types of flares on the Sun, but no-where near as big as this. On our Sun, you can do incredibly detailed studies on this kind of activity. It’s difficult to extend that understanding to other stars because the data we need hasn’t been available until now. “This is an incredibly young star, only about 2 million years old. You’d call it a baby – it’s going to live for ten of billions of years, so it’s in the first one percent of its lifetime. Even though it’s much cooler than our Sun by about 2000 degrees it is roughly the same size, but pretty large for an M star. This is because it’s still being formed from gas in the disc and contracting and cooling until it reaches the main sequence, staying at a certain radius and luminosity for billions of years. The X-rays from these large flare events are thought to affect the formation of ‘chondrules’, flash-melted calcium-aluminium-rich grains in the star’s protoplanetary disc. These gather together into asteroids that eventually coalesce into orbiting planets. The study adds to our understanding of how flares ‘perturb’ the protoplanetary disc, moving around the material that impacts on planet formation and affecting the eventual structure of a planetary system. 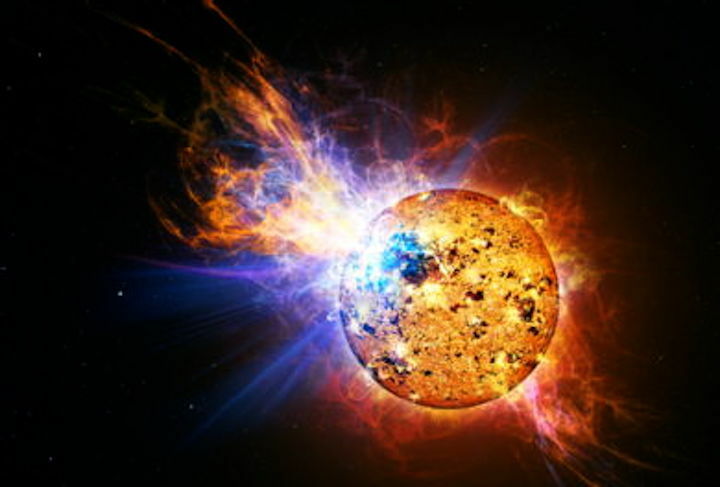 Professor Peter Wheatley, James’s PhD supervisor, said: “A massive flare like this could be advantageous for planet formation, or it could be disruptive. This particular star won’t have formed its planets yet so this type of flare activity is something that astronomers will need to take into account when considering planet formation.